See also my article on tuning pins and my tuning keys for sale. All of the old Gaelic harps as well as the extant continental instruments from before 1800 have tuning pins with square or rectangular heads, meaning that they were tuned with a tuning key. Such pegs go back at least as early as the 7th or 8th century AD as they are seen on some extant Germanic lyres. However there is a great dearth of information about what medieval and other early tuning keys were like, and none seem to be preserved with good provenance. This page is an attempt to gather evidence and documentation, with the hope that other people might send in more evidence. I am concentrating on the Gaelic harp tradition of Ireland and Scotland but will include relevant evidence from anywhere in Europe before c. 1800. The square drives of old harps can tell us a little about how their tuning keys worked. As far as I am aware, all of the old Gaelic harps (and also probably the old gothic and baroque harps) have tapering drives. This is in contrast to modern harps which usually have parallel-sided drives. Also the drives on the old harps are larger than the tuning pin shafts. This means that a historical tuning key would have a larger socket than a modern tuning key. I think the idea of this tapered design is that the key is more likely to fit snugly onto slightly varying sized drives on hand-forged or handmade pins. According to Measuring Worth, this would be something like £14,000 in today’s money - that would pay for a lot of drinking! Martin van Schaick has surveyed the pictorial (and written) evidence for medieval European tuning keys from c. 1100 to 1300. His book The Harp in the Middle Ages includes a diagram illustrating the different shapes of tuning key visible in medieval manuscript miniatures of King David tuning his harp (p.57). Nine different shapes are shown; however it is not clear that these represent realistic depictions of instrument design, rather than fantasy impressions of ancient music making. 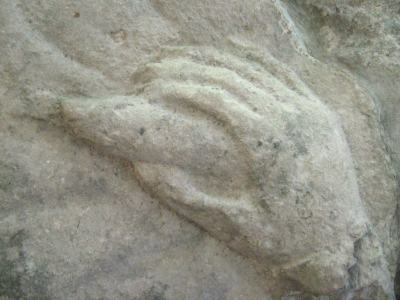 The stone sculpture from Jerpoint Abbey, showing a reclining knight with a harp beside him, includes this cigar-shaped object held in his right hand. Is this his tuning key?